Citation: C N Trueman "Leni Riefenstahl"
Leni Riefenstahl found fame in Adolf Hitler’s Nazi Germany. Leni Riefenstahl became Nazi Germany’s most famous film maker. In a state where women played a secondary role to men, Riefenstahl was given a free hand by Hitler to produce propaganda films for the Nazi regime. Leni Riefenstahl was born in August 1902. She was christened Helene Berta Amalie and she was born into a prosperous family. Her father owned a successful plumbing and engineering firm and he wanted Leni to follow him into the world of business. However, her mother believed that Leni’s future was in show business. At the age of eight, Leni started dancing lessons and she was enrolled into the Berlin Russian Dance School where she quickly became a star pupil. Riefenstahl gained a reputation on Berlin’s dance circuit and she quickly moved into films. She made a series of films for Arnold Fanck, and one of them, “The White Hell of Pitz Palu”, which was co-directed by G W Pabst, saw her fame spread to countries outside of Germany. In 1932, Riefenstahl produced her own work called “The Blue Light”. This film won the Silver Medal at the Venice Film Festival. In the film, Riefenstahl played a peasant girl who protected a glowing mountain grotto. The film attracted the attention of Hitler, who after his appointed to chancellor in January 1933, appointed Riefenstahl to be “Film Expert to the National Socialist Party”. Hitler is said to have believed that the image Riefenstahl created for herself in “The Blue Light” epitomised the ultimate German woman. In 1933, Riefenstahl made a short film about the Nazi Party’s rally of that year. She was asked to make a much grander film of the 1934 event. This led to probably her most famous film – “Triumph of the Will”. The film won awards in both Nazi Germany and Fascist Italy but also, ironically, in 1937, it won the Grand Prix in Paris. The film used camera angles rarely seen before and frequently used shadowy images as opposed to images that were visually clear. The cameramen also did some of their work on roller skates. Her next major piece of work was to film the 1936 Berlin Olympic Games. Again, this film, called “Olympia”, won many international awards. Her next major project was “Tieland” in which she played a gypsy heroine. Filming took her out of Germany and to Franco’s Spain. By the time the war ended, Riefenstahl had yet to edit the film and it was impounded during the denazification tribunals. After the war, Riefenstahl had many questions to answer. She was accused of being the visual mouthpiece of the Nazi Party – something she denied. Riefenstahl pointed out that both “Triumph of the Will” and “Olympia” were made by her own independent film company and they were not mere Nazi stooges. She also pointed out the fact that she never been a member of the Nazi Party. Riefenstahl also had an enemy at the highest level of the Nazi Party –Joseph Goebbels. His diaries make it clear that she was seen by himself as a competitor for Hitler’s attention as opposed to a team player. 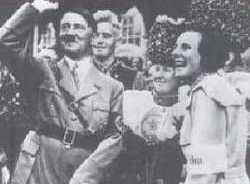 She enjoyed such freedom to film because she had support from Hitler – something that Goebbels could not accept. Immediately after the war, Riefenstahl was arrested and held for a short time at a lunatic asylum. She was rapidly ‘denazified’ in 1945 and not charged with any crime. However, she was forbidden from making films and her films remained banned in post-war Germany for years. This concerned some as Veit Harlan, the maker of “Jew Süss”, a virulently anti-Semitic film made during Hitler’s regime, was allowed to return to film making after the war ended. Some believed that Riefenstahl was forbidden to return to film making simply because she was female – in an industry dominated by men. Eventually, Riefenstahl did return to film making and photography. She produced underwater films of the Red Sea. In 2002, she became the only person over 100 to release a film – “Underwater Impressions” which was a selection of footage from film clips made by Riefenstahl from the previous thirty years. “Death does not frighten me. I’ve known so many peaks and troughs – enough for three life times.” Riefenstahl aged 97. “Artistically she is a genius, and politically she is a nitwit.” Liam O’Leary, film historian. Leni Riefenstahl died in September 2003, aged 101.